Findlay Chevrolet was recently certified by General Motors as a member of its Green Dealer Program. The certification recognizes the local automotive dealership’s efforts to promote energy efficiency, waste reduction, water conservation, resource preservation, renewable energy, natural habitats and community outreach, while at the same time selling cleaner and greener vehicles. 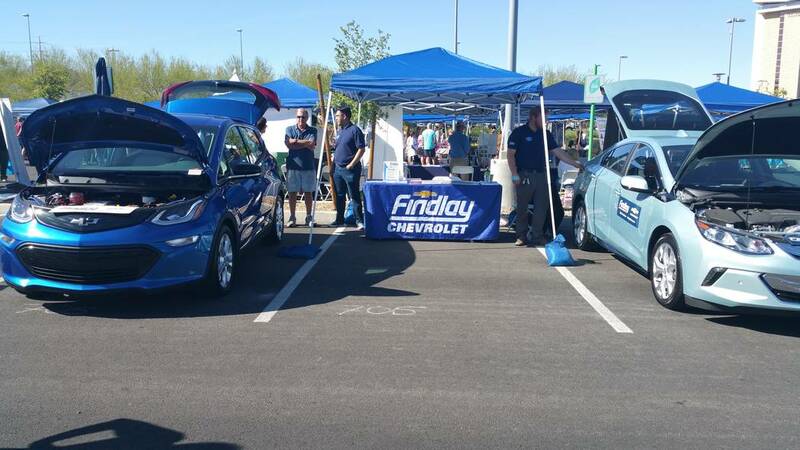 Stan Hanel Findlay Chevrolet exhibited a Chevrolet Bolt EV electric car, left, and a Volt plug-in hybrid electric vehicle, right, during a GreenFest 2018 event at Downtown Summerlin earlier this year. 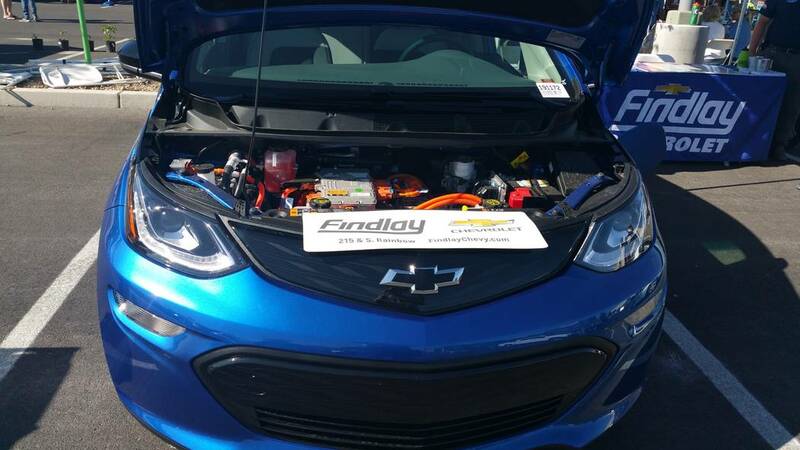 Under the hood of a Chevrolet Bolt EV electric car exhibited by Findlay Chevrolet. GM’s Green Dealer Program was started in 2014, and only 179 of its automotive dealerships have been certified since that time. These include all GMC, Chevrolet, Buick and Cadillac dealerships nationwide. In order to qualify for Green Dealer certification, an independently owned GM dealership must apply for an assessment by the company’s Green Dealer support team, which reviews 60 eco-friendly business practices across 10 categories. Each dealership must have a high percentage of these practices in place within each of the 10 categories before earning certification.Continuing improvement year after year can lead to ongoing annual recognition by GM for each Green Dealer. “GM has committed to being a leader in environmental stewardship, and we’re proud that our dealers share this commitment to serve and improve the communities where we work and live,” said Kurt McNeil, GM vice president of sales operations. The Green Dealer Program is just one of many efforts by GM to find innovative ways to create money-saving efficiencies that are also environmentally compatible with local communities, including regions where the company’s manufacturing plants and operations centers are located. GM is a leader in designing and producing cleaner and safer automobiles through innovations in “lightweighting,” zero-emission platforms, electric motor drivetrains, advanced driver assistance systems and autonomous vehicles. The innovative Chevrolet Bolt EV is an electric car that has been built with an aluminum chassis to minimize weight, as well as a 60-kilowatt-hour battery pack and electric-motor drivetrain that can propel the vehicle over 230 miles on electricity before requiring a recharge. In its other automotive divisions, the GM Cadillac CT6 has introduced advanced driver assistance systems for improved safety that include a new Super Cruise feature for smarter cruise control driving on expressways. More information about GM’s corporate-wide sustainability programs can be found at the General Motors Green website, www.generalmotors.green.